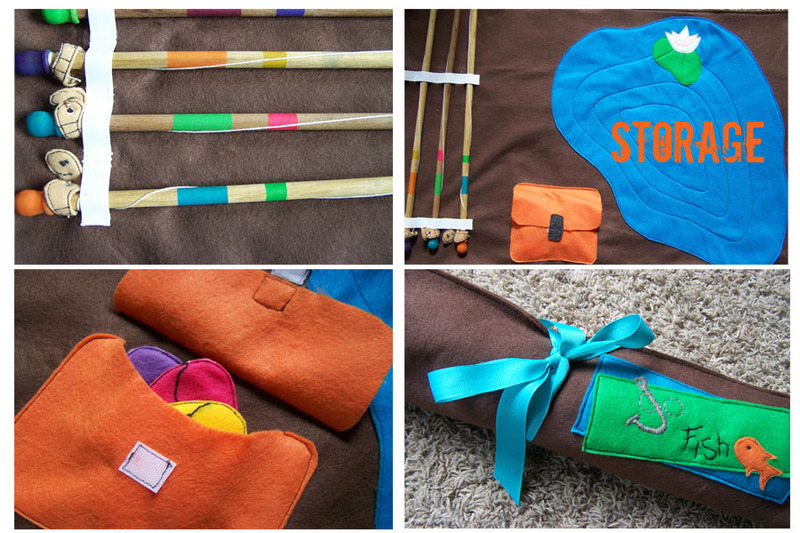 I was so pleased when I woke up today, and found that my Fishing Hole Roll Tutorial had been featured on Made. Wahoo. I've thoroughly enjoyed Celebrate the Boy, and have been inspired by so many of the fantastic projects. To have my project included in any sort of round up is thrilling. I thought that I'd re-post the tutorial here on my blog, seeing that the first time I did so was as a guest blogger. Today I'm going to introduce you to the "Go Fish: Fishing Hole". I was inspired to make this project after seeing this post by Richelle. I decided to add a few of my own personal touches to it. I made a storage caddy for the fishing poles that has a pocket for the fish, and a pond for fishing in. It is a great toy to keep your children busy while introducing them to colors. Want to make one for yourself? I'll give you a talk through tutorial. Here we go. 4-1" candle base's (found in wood section of Joann's near the dowels). Thin batting for added thickness of fish (enough for all 8 fish). 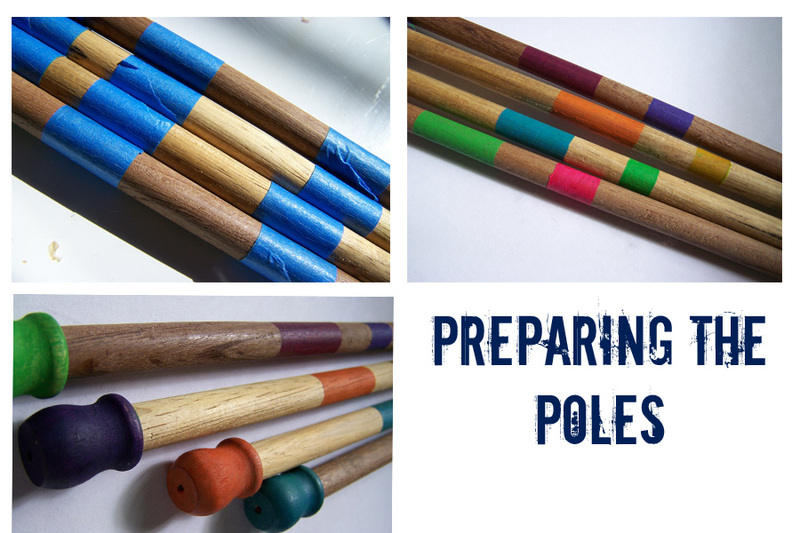 First we are going to prepare the poles. To do so, saw each dowel in half lengthwise. You will end up with four eighteen inch poles. Sand the rough edges of each dowel. Next tape off your poles so that you can add some colorful stripes at the bottom of your poles. I just eyeballed the spacing, creating two painted sections per pole. I then painted each section a different color. You will also want to paint your four wooden candle bases (seen in bottom left photo). When the paint has dried you can attach your candle bases to your poles with a bit of wood glue. I really like adding the candle bases to the bottom of the pole, it creates a nice grip for little fingers, and adds a little extra detail to the pole. Now it is time to prepare your fish. Now this is a really basic talk through. Feel free to contact me if you have questions about any omitted steps. First you will want to sketch out a basic fish and worm shape. If you don't feel comfortable doing so you can print off a pdf version of my files here (for personal use only please). 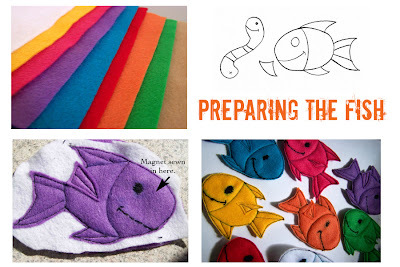 Once you have your fish/worm designed you will want to cut out one fish per color. I then handstitched the faces onto the fish and worms. 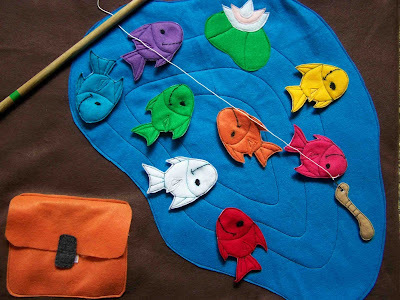 Next cut out a rectangle of batting and coordinating felt for each fish. The rectangles should be slightly larger than the size of the fish. Sewing the fish together this way will make it easier. You won't have to worry about lining up your shapes perfectly. Now stitch the inner details of the fish. I stitched the lines between fins and the body, the gill line, and the details on the tail. It is now time to stitch around the perimeter of the fish body, I used a triple stitch for added reinforcement. You will want to start at the beginning of the bottom fin, sew around the tail, and back toward the head. When you reach the head of the fish you will want to sandwich one magnet between the top layer of felt and the batting. 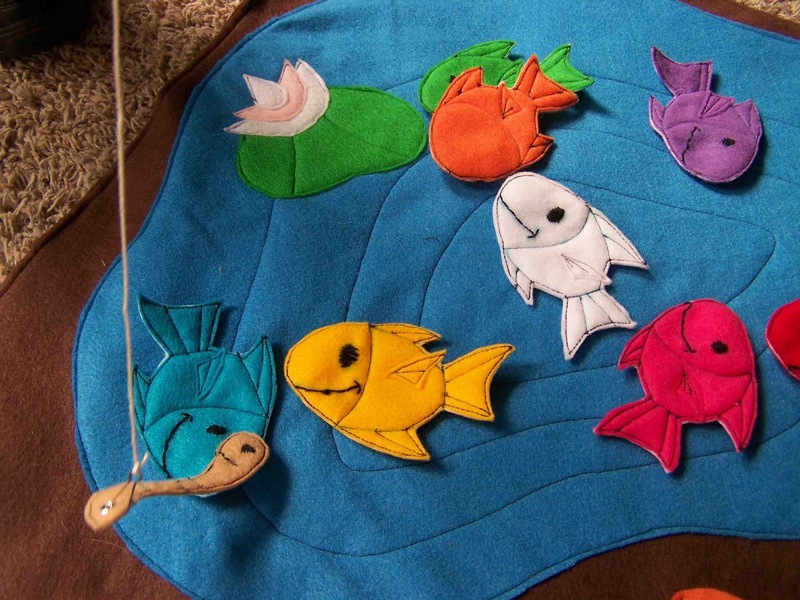 Continue stitching around the fish. Repeat with each fish. Cut off excess fabric from fish. You will use the same basic technique to create your four worms. We are now going to assemble the poles. Attach one eyelet at the end of each worm. 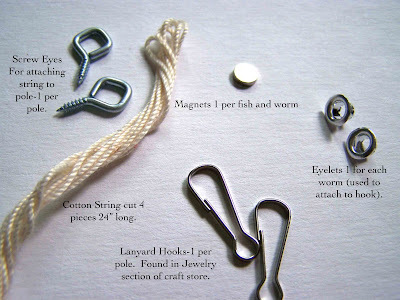 You can do this by using an eyelet attachment tool and a hammer. Connect each worm to a lanyard hook by sliding the worm onto the hook at the eyelet. Screw the screw in eye to the end of your fishing pole. 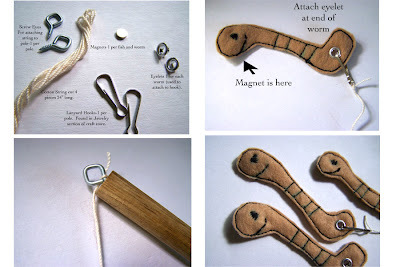 Now attach your string to the worm and pole at the hook and eye. 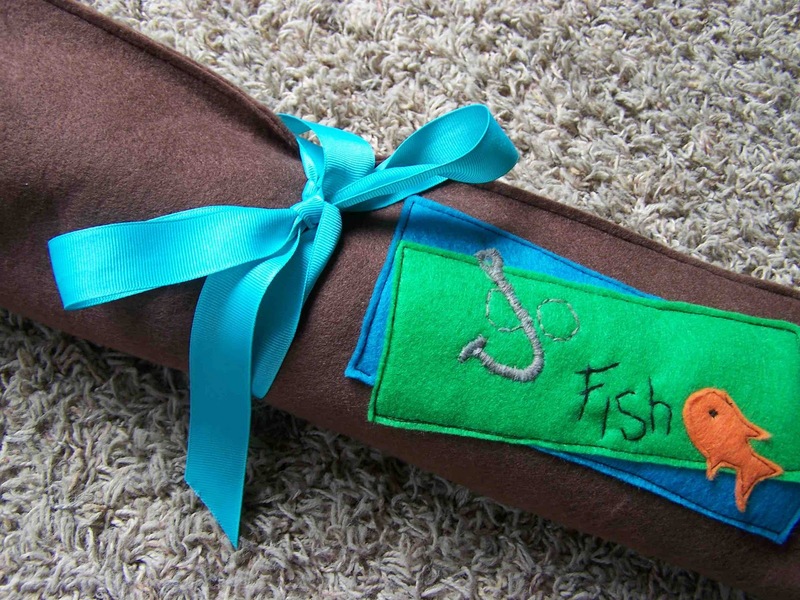 To create the fishing pond/storage caddy you will want to cut your felt by the yard into two pieces, each 22"x36". On one piece of cut felt you will want to sew your two pieces of elastic (spaced about 10 inches apart). You will create four sections in the elastic for storing the fishing poles. Now create a small storage box for the fish. mine is probably about eight inches wide and six inches tall. Make a base and a pocket flap. 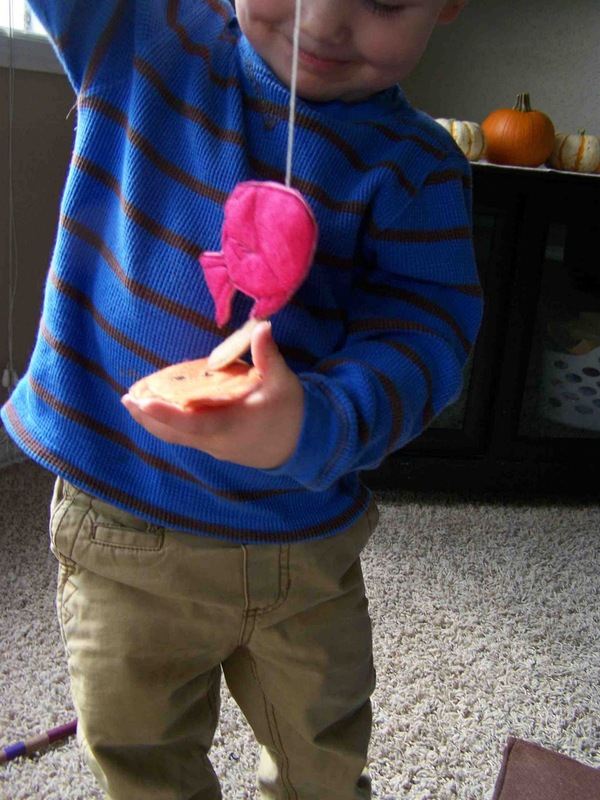 Use a small scrap of felt to create a tab that is secured with a small piece of velcro. Attach the velcro to the tab, and the base of the pocket. Next sew down the base of the pocket leaving the top open. Sew down the top pocket flap along the top. 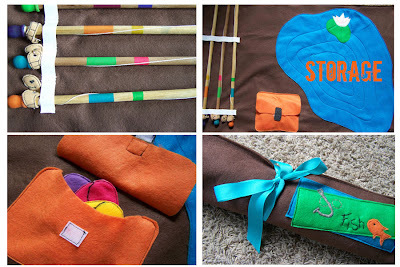 Sew down your fishing pond. This can be any shape or size. I added a small lily pad, but some extra details like rocks, frogs, or cat tails could be fun. If you want to add a tag on the outside of your fishing pole roll, now is the time to do it. Place it on the Bland piece of felt. You will want it to be attached at the pond end of the rectangle. Now you could create a nice velcro strap for your roll, but I chose to tie the roll closed using a piece of grosgrain ribbon. You've done it. You've created your very own fishing hole roll. Now it's time to catch some fish. That's awesome you were featured on Made! That's big time! Congratulations! But then again, it's such a great tutorial and I was honored that you shared it as a guest on my blog. :) Best of luck to you! Congrats! I love this idea and you always do such nice work! What a fun game! Congrats on your feature!! This is one of my FAVORITE projects of yours -- I was just thinking this morning that I should make one because the flimsy plastic fishing set we have is gradually becoming more and more broken. And it's not cute at all. So fun to be featured -- you totally deserve it! This is amazing! Great tutorial! I am loving all your creations! I hope you will join me in the "Being Creative" party on Sundays. Darling! I linked to your tutorial on my Free Felt Patterns website. Cute - I just pinned it. hey! Tricia these are the nice creations that you share I really try these. This is so interested!And I love this idea,Where can I find more like this? What is the size of the fish? I found strong magents at Walmart in the craft section that work well. They were $3.48 for 4 magnets, but work well! I had the same problem with magnets...If someone found a great deal on magnets please let me know! That was very cute. I'm going to make one for my kids. They love fishing, I'm sure they'll appreciate it. Going to have to make this for my grandsons. I will post photos on my fishing website when done. Thank you.